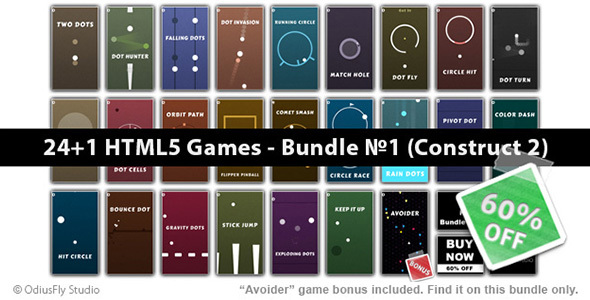 A collection of 24 awesome games + 1 game bonus available on this bundle only. Made in Construct 2 (capx file included). Enjoy the games! – 60% OFF, Get this bundle now! – In case you purchase an extended license and you need a reskin service, i will help you one time for free. I will use your graphics, logo, links, media, whatever you need based on my game template. – If you have any pre-purchase questions don’t hesitate to contact me.